Located at the southern corner of Blackpool Pleasure Beach, the Golden Beach Hotel is as cheap as the chips you're likely to be guzzling on the front. Bit tired and dated in places, but very reasonably priced. If we were writing an end-of-year school report, we really might say, 'could try harder'. At the end of the day though you get what you pay for, and if you are looking for a comfortable budget property that allows you spend more on the rides at the Pleasure Beach, then this one may be perfectly adequate. 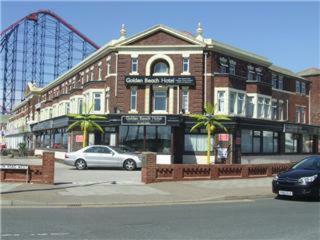 The hotel occupies a superb position on Blackpool's dazzling South Shore. The Burlington Road tram stop is practically outside your door making it just as ideal for trips up to the Tower or to the Golf Club up on North Shore. For entertainment, Golden Beach Hotel has a bar, plus a disco on Friday nights. There is live entertainment on a Saturday night, and a games room for kids. Bed & breakfast rates include free on-site parking and easy access to the trams that run up and down the coast. Blackpool Pleasure Beach Train Station is a 3-minute walk away. Each room has an en suite bathroom and tea/coffee.